Mike Norman releases his new economic education video series: Pitbull Economics! Capitalism often thrives at the expense of workers and wage earners. Here is a classic example: Q1 corporate profits weren't bad at all, but only because workers got laid off in massive numbers. If you are going to survive in our current model, then you have to think like a capitalist: invest in stocks, own a business, seek to control capital--both physical and human. If you think you're gonna get a good job that pays well and have long-term job security you're only kidding yourself. Even Obama is not on your side. Look at his remedy for the autoworkers: throw Chrysler to bankruptcy. GM is probably next. Good for capitalists, bad for workers. Daily fiscal drain continues, but is market rally vulnerable? The net, daily drain from tax collections continues (see chart below), but does that mean the stock market rally is vulnerable to a renewed decline? The answer is, probably not. That's because two other things have occurred, or are occurring, at the same time. First, bank credit appears to have stopped contracting. So whatever quantity of its own money the government siphons off as a result of tax collections, the private sector's money--credit--may be about to start flowing again. Secondly, and perhaps most important, is the fact that households have a $455 billion cache of personal savings to draw from: near-record levels. This virtually ensures that the stock rally will continue, as long as confidence keeps improving. Your strategy should continue to be to buy dips. A more positive outlook is starting to develop and that's bullish for stocks. Even so, there's also still enough pessimism for the market to climb that "wall of worry." There has been no Iraqi "Peace Dividend" so far under President Obama. In the first quarter of this year, spending on national defense has declined by 1.1%,yet non-defense spending has only increased by 1,0%--a net loss in overall spending. On the other hand, in the fourth quarter of 2008, defense spending under President Bush dropped 0.3% from the prior quarter and non-defense spending jumped 3.4%, meaning that President Bush gave the nation more of a "peace dividend" than the current, democratic/liberal president. Sadly, most Republicans would probably be angry at Bush over this. They're too stupid to see how smart Bush really was! First quarter GDP came in down, 6.1%, equating to a loss in output and national income of $125 billion. The three components of GDP that always tend to add to overall output--Personal Consumption, Government Spending and Investment and Business Investment--tell a very interesting story. While personal consumption rose from Q4 2008, it is still $200 billion below the peak seen last year, so it remains weak. Business investment has plummeted--absolutely cratered! But here is the shocking part: Governemnt spending and investment fell in the first quarter. FELL!! With consumers tapped out, out of work or unable to get credit and with business seeing their profits fall or going bust and not able to get credit either, the only hope for an increase in GDP or just something that could arrest the decline would be HIGHER LEVELS OF GOVERNMENT SPENDING. Yet, government spending is falling. This is so sad because the only thing that precludes us from getting out of the mess that we are in now is a warped and fallacy-laden belief system that causes us to view government spending as bad, even as the facts show otherwise. The longer we allow this to continue, the greater the risk that our economy loses competitiveness vis-a-vis other countries of the world. And if that happens, the true legacy that we leave to our kids and grandkids will not be higher levels of government debt, but a lower standard of living and more poverty. It is an outrage and a great failing of President Obama that he has allowed this to happen. Because of a character flaw that causes him to feel the need to be surrounded by those who represent the status quo--or worse--deficit hawks and debt "terrorists" we are rapidly allowing the wealth producing capacity of our nation to waste away. By the time anyone realizes it, it will be too late. The government is still taking in more than it is spending on a daily basis due to the effect of April tax collections. This is fiscal drain or fiscal drag. It could mean the stock market is vulnerable over the next few days or weeks, however, at the rate the government is spending the fiscal drag will soon reverse to fiscal stimulus. The drag is already starting to diminish. My recommendation is to buy stocks into any near-term dip that occurs. Like the one we are getting today! Final results of the poll are in! A total of 38% said that spreading the word was either going well or getting easier. (That's encouraging!) Only 2% said it was getting harder and 55% said it was basically the same. Catch me this afternoon on Bulls & Bears on the Fox Business Network at 4pm ET! "The reports of my death are greatly exaggerated"
You gotta kill the beast. The great failing of policymakers in the Obama Administration (and there have been many failures) was the decision to sustain the financial sector in its present form, where intermediaries like Goldman Sachs take huge, risky bets for outsized returns while adding nothing of value to the real economy. This has already been shown to inject unecessary risk and instability to the entire financial system, while siphoning off brainpower that could be used in productive work. For some reason, Obama has filled his Administration with Wall Street bankers and financial types who have slyly crafted policy to sustain and perhaps even enhance the power of their domain over the rest of the productive economy. At the same time the commercial banking system, which itself is a construct of the Federal Government, is being largely deconstructed. Major chunks of the banking sector's assets (which, at least obliquely, are the property of the public) are being sold off to some of the very speculators who targeted these institutions for demise, with taxpayer guarantees against losses to boot! For a president who, purportedly, ran for office as a representative of the middle class and the working man, this seems incomprehensible. If you are not a member of the Wall Street clique, or feel left out and ignored by the president and his policy team, you should rise up and let your sentiments be known. Barack Obama is a brilliant guy with huge potential, but I am starting to think that he has a character flaw that will do him in. It is his need for validation, which causes him to surround himself with people who look impressive from a distance, but who come from the same, ruling class that zealously guards the status quo. Chris Walen of Institutional Risk Analytics said he's gonna do the "Mexican Hat Dance" on me! Perhaps because we are rapidly approaching Cinco de Mayo, I don't know. Anyway, Chris Whalen of Institutional Risk Analytics sent me this angry email after I sent him a note telling him that the Treasury will not be "reimbursing" the Fed(that's nonsensical, anyway!) for mark-to-market losses on some of the Fed's asset holdings. I also told him that the Fed already gave $15 billion in profits to the Treasury so far this fiscal year. By the way, Fed expert, what is you loss estimate for all of the "assets" on the Fed balance sheet? That is the basis for my comment. Next time you tee off on me w/o doing your homework, I am going to do the Mexican hat dance on you Mike, in public. My guess is that the Fed could be facing hundreds of billions in impeded losses on its "assets." Since you did not bother to ask in your rude, discourteous note below, you have no chance to evaluate same. How does that affect you expert analysis? Better, keep your comments to yourself next time. Of the $2.17 trillion currently on the Fed's balance sheet approximately 41 percent of that amount is in risk free assets: Treasuries, Gov't agency securities (backed by Treasury) and foreign currency, where foreign CBs carry all the exchange risk. That leaves $1.3 trillion of "other assets," which include MBS, Term Auction credit, Bear Stearns, etc. Let's assume it's ALL bad (you said, a couple of hundred billion; i'll go you one further and say, all). Because the Fed can acquire assets for zero cost (it merely credits the reserve account of the seller's bank) it can easily acquire enough safe assets, to generate income that would go toward offsetting those losses. Yes, it would take time and, yes, large-scale purchases of any asset, including Treasuries, would result in a reduction of the interest rate paid. However, the point is the Fed could easily grow its balance sheet, and its income, sufficiently, to offset whatever mark-to-market losses it may currently have. The problem with you is, you're arrogant, a hot-head and you think you're somekind of genius, but you're not. I used to like you, and thought you had insights. It didn't take me long to find out that that was not true. Your last appearance on my radio show was a joke. My listeners could give you a good schooling. Better yet, they could do the Mexican Hat Dance on YOU! 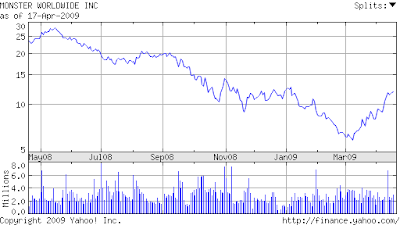 Look at the stock of Monster Worldwide (MWW). That company provides employment solutions, job search, etc. The stock has shot up sharply in the past month. It could be signaling that the worst is over for the job market. With the average monthly fiscal deficit running about $160 billion so far this year that old, "Sell in May" stock axiom may not work this year. If anything, it's likely to be fleeting so don't expect a big stock market downturn. Normally it takes several months of deficit spending to replenish the wealth drain that hits the private sector when taxes are paid in April. Treasury data shows that the April '07 surplus of $178 billion was the second largest on record (the largest was April 2001: $190 billion). Both of these wealth drains preceded huge market declines. It took four months of deficit spending following that April '07 drain to replenish the level of private sector net wealth that was taken away. Not surprisingly, when enough deficit spending finally occurred, the stock market rallied. The Dow was up 5%in September 2007. This year the wealth drain is likely to be far smaller than in prior years thanks to a weak economy and with so many people out of work. However, government spending rolls on and at levels never seen before. So far this month, the Treasury has collected about $200 billion in taxes. That's less than half of the amount collected in April of last year and even below the level in April 2002 when we also had a weak economy. Yet spending has been averaging over $320 billion per month. So whatever the net drain ends up to be for April--say $250 billion--most of all of that will be repenished in about 12 business days! That's pretty much where we are right now and the reason I believe the market correction that had been occurring since last Friday, is OVER!! So, BUY STOCKS, because this year is NOT the year to "sell in May and walk away." Here are the results of my poll question, "How are you finding the task of educating your friends and colleagues on in-paradigm economics?" While 61% of the respondents said they are not making much progress at all, a combined, 36% said that they are making progress or that it is going well! Only 3% said it was impossible or harder than ever. The results are mildly encouraging. In the article he claims that the Treasury will have to "reimburse" the Fed for losses on its assets. The article is rife with misinformation. Your journalism continues to misleading and misinformed. This ongoing claim about the Fed not disclosing what collateral it lends against is completely wrong and you know it. I've been all through this with you and you admitted to me that the collateral and margins are fully disclosed. Moreover, Bernanke gave the website out during recent Congressional testimony. You are not a journalist; you're a novelist. Why don't you write a good conspiracy story? I think it would do very well as you have a vivid imagination. Here is Mark Pittman's email in case you feel inclined to tell him what you think of his agenda journalism. And if someone can get the name of Bloomberg's managing editor, that would be great. We need to be emailing this person as well to let them know that Bloomberg journalists are conducting personal-agenda-based journalism. All mainstream economists would gasp at the statement above, yet it is true. In order for someone to "net save" someone else has to net spend or invest by the same amount. Thus, if the United States Government is the largest debtor (we can say, investor, same thing), then the non-Federal-government sector of the U.S. and the rest of the world (ROW) are net savers. The graph shows that as the Federal deficit increased (gross savings of the Federal Gov't decrease), then the savings of the U.S. domestic sector (including states and localities) and the rest of the world (ROW) saw an increase in their gross savings. I used a starting point of 1997 but the starting point is irrelevant. Notice, too, that each time the gross savings of the government increased, the gross savings of the private sector decreased and vice-versa. 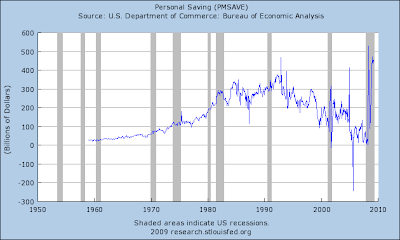 In fact, the periods of rapidly declining government "savings" equated to periods of equally rapidly rising periods of private sector savings. Lesson here is: Deficits add to private sector savings. The article basically covers Treasury Secretary Geithner's message to Americans that we cannot get out of this economic mess alone. If this is truly his belief than he is a very weak student of history. Back in the 1930s countries pursued their own policies in dealing with the depression and the countries that abandoned the gold standard (a de-facto stimulus) got out of the depression earlier than those that did not or, in the case where the gold standard was abandoned later. Economic recovery was independent of other nations' policies. "The crash has laid bare many unpleasant truths about the United States. One of the most alarming, says a former chief economist of the International Monetary Fund, is that the finance industry has effectively captured our government—a state of affairs that more typically describes emerging markets, and is at the center of many emerging-market crises. If the IMF’s staff could speak freely about the U.S., it would tell us what it tells all countries in this situation: recovery will fail unless we break the financial oligarchy that is blocking essential reform. And if we are to prevent a true depression, we’re running out of time." Investment bankers running the Treasury. Former Goldman Sachs' employees at every high level policy post that affects the economy. A belief that the United States must preserve its financial sector and keep it the most dominant in the world because, somehow, that equates to national power. "But there’s a deeper and more disturbing similarity: elite business interests—financiers, in the case of the U.S.—played a central role in creating the crisis, making ever-larger gambles, with the implicit backing of the government, until the inevitable collapse. More alarming, they are now using their influence to prevent precisely the sorts of reforms that are needed, and fast, to pull the economy out of its nosedive. The government seems helpless, or unwilling, to act against them." What has this led to? The failure to understand the banking system and how to fix it. Efforts to sustain a financial sector that adds little value to the real economy. A perverse misallocation of our capital, particularly human capital. Incentvizing non productive work--essentially, paper flipping--for obscene compensation. The fostering of a "casino economy," where the production of real assets is declining relative to the dollar amount of traded contracts that, again, add no real value. "Policy changes that might have forestalled the crisis but would have limited the financial sector’s profits—such as Brooksley Born’s now-famous attempts to regulate credit-default swaps at the Commodity Futures Trading Commission, in 1998—were ignored or swept aside." I'm no big fan of the IMF, however the author of this article,who is a former IMF economist, has it absolutely right on this point. Unless we take apart the financial sector and reduce its influence on policymaking, we will run our nation into the ground in a cataclysm of financial speculation. Obama is being held hostage by the debt terrorists. Can you believe this? The president has now become convinced that the government must cut spending in order to have enough money to make the investments necessary to bolser output and employment. With this kind of thinking it is unlikely that we will ever fully recover from this problem. David Walker's admission to me that, "there is no solvency issue." 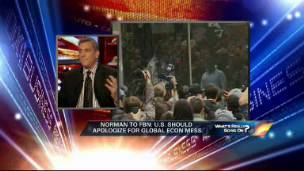 Deficit terrorist #1 David Walker of the Peterson Institute states to host Mike Norman there is no solvency issue! April 20 (Bloomberg) -- Bank of America Corp., the largest U.S. bank by assets, reported first-quarter profit more than tripled on gains from home refinancing and trading. Continuing the recent trend of vastly improved performance of banks in general. Notice the trading gains that came through Merrill. Many analysts criticized BAC's purchase of Merrill, but Ken Lewis may have the last laugh! This year the tax effect might be fairly strong. With households stretched any reduction in disposable income could hurt the economy. There is a bright side, though. During prior recessions tax payments to the government were relatively low and that old axion of sell in May and walk away, didn't work very well. My recommendation is that if there is a correction, use that as an opportunity to buy stocks. The pink line is the April fiscal surplus or deficit and the blue line is where the S&P 500 index was one year later. Stocks usually bottomed following April deficits or weak surpluses (1983, 2003-2004), whereas big surpluses (2000, 2007) presaged a peak in stocks, followed by sharp declines. By the way, where is Meredith Whitney and Mike Mayo. Please feel free to listen to Meredith's theme song. I received an email a short while ago and I thought it would be instructive to share my reply comments. The email was from a reader of this blog who asked me to deconstruct one economist's points regarding stimlulus and gov't spending. You asked how the current economic policies would affect you. A very quick answer is lower wealth. The expansion in government and government control over the private sector is unprecedented. The private sector will grow more slowly as gov’t takes on more control and bigger size. Much of what Obama is doing is redistributing wealth for “fairness” or “justice” and he is much less concerned with economic growth as we have historically known it in this country. Free markets and free people also go hand in hand. Gov’t control expansion and lessening of freedom go hand in hand. That is the short explanation. As usual, this guy is totally out-of-paradigm and wrong on every point he makes. Deficit spending leads to higher wealth of the non-governmental sector by definition, as the non-governmental sector will end up holding more assets in the form of Treasuries. Assets minus liabilities equals net worth, or wealth, so if the amount of assets the public holds increases due to deficit spending, the public becomes wealthier by the amount of the deficit. Only the deficit is said to be financed with borrowing (and even that is not really true). The government spends by crediting bank accounts, which is done by a simple keystroke on the Treasury's spreadsheet. Spending is ongoing, so again, by defition, it is done before the sale of securities or the payment of taxes. The money to buy securities and pay taxes comes from government spending. Think of the game of Monopoly. If you land on "Community Chest" and it tells you that you have to pay a tax, you pay with money that was distributed by the game. In essence you gave back some of the game's money. Same with the way our system works. Furthmermore, because the government spends this way and since the Federal Gov't is the monopoly issuer of non-convertible currency it is not limited in how much it can spend. The government pays for redemptions and/or the principal or interest on its debt the same way it pays for everything else: by crediting bank accounts. Thus, there is never a problem in meeting a redemption or paying principal and interest--at any interest rate! The sale of Treasuries is not borrowing per se. It is designed to support an interest rate that the Fed chooses. Selling securities is how the Fed and Treasury manage the level of reserves in the banking system and the level of reserves determines the interest rate. Taxes can either add fiscal drag or throttle it back, depending on whether taxes are increased or decreased. The government requires payment of taxes in its own currency, and that is what gives the currency value. Even if you don't owe taxes someone else probably does so most of the public naturally wants to hold some government money. However, the government's money is not the only money we have in our economy. There are many other forms of "private sector" money, like checking accounts and other demand deposits and all sorts of bank credit and private credit, which, by far, comprises most of what we call money. Interest rates are a parameter set by the central bank. Period! That should be obvious to everyone by now. The Theory of Loanable funds (what he uses as the basis for his argument that government spending causes interest rates to rise) is just that--a theory--and it's wrong! Free markets are a fallacy. What we have are competitive markets. All nations employ policy of various sorts to gain competitive and comparative advantage. In the U.S. we have always had taxes, regulations, tarriffs and other, public policy initiatives with economic goals, over-arching the market, as do other nations. Moreover, large corporations routinely dominate their markets by virtue of their size, making the idea of perfect competition nothing more than a quaint, yet inapplicable, ideal. If he is talking about the growth of spending crowding out the private sector then he ought to look at the facts. In 1946 gov't spending was $36 billion annually, today it's approaching $4 trillion, yet interet rates are lower, we use less of our industrial capacity, 12 million people are unemployed, 5 million homes sit unsold, 3 million vehicles are waiting for buyers, people can't get health care even though the services are available to them, families can't send their kids to college even though there is room for them. In short, despite an 11,000% increase in government spending over the past 63 years, we still are not using all the wealth-producing capital--both real and human--that we have in this country. Treasury Secretary Geithner's "brilliant" stress test plan unfortunately cannot be coming at a worse time for some banks. The economy is stabilizing and conditions are starting to improve after a brutal, 2-year erosion. Many savvy bank analysts understand that the banking sector is pro-cyclical, meaning that asset performance, lending and earnings go up when the economy improves and they go down when the economy deteriorates. Some insightful people also realize that with the yield curve now extremely steep, banks will be able to "earn" their way out of most of their difficulties. This was mentioned recently by Warren Mosler and Muhammed El-Arian of Pimco. However, with the stress tests taking place now there is a strong likelihood that some banks won't make the cut. Indeed, it almost seems to me that some banks MUST fail just to show that Geithner's plan was not some kind of sham. While I am not a conspiracy theorist by nature, I can't help thinking this way--that someone will have to be "sacrificed" so that the test looks legit and tough. That's the big question, but you can rest assured that some banks--and perhaps even a very big one--will have to "fail." If it's a big bank or, if many banks are deemed to be deficient, it could destabilize markets once more. And for what? No decent reason at all, because given the current change in conditions all banks will be in fine shape in a year. Of those who will be sacrificed some might not make it back. Nor will their shareholders who are innocent of any wrongdoing. It's just another execution all in the name of "paying back the taxpayer." Stress tests should have been performed in 2007. Doing them now at the bottom of an economic cycle and amid a populist revolt is sheer folly. But now that I think of it, stress tests were performed in '07, by the brilliant folks at Standard & Poor's and Moody's. What a world! The other day Goldman Sachs announced that it would be paying back TARP funds and it did an equity offering to raise the money. Because equity offerings tend to be dilutive, the stock dropped 12 percent the very next day. Investors handed over their cash for shares in GS, leaving them with shares that were worth less than the day they bought them. (And which still are!) Their net worth—otherwise known as their wealth—decreased. Yet by the twisted logic of Treasury officials, lawmakers and most of the public, this constituted a “paying back” of the taxpayer. In contrast the TARP funds “cost” nothing to the taxpayer because they were created by pushing a button on the Treasury’s spreadsheet. Yes, it added to the monetary base, but there was no immediate danger of inflation nor is there any real evidence that can be put forth, which would show certain inflation at some point in the future. The original allocation of TARP funds was a benefit to taxpayers. The paying back was a cost. The current belief system has it all backwards. More banks, including JP Morgan, plan to “pay back” the taxpayer very soon. With all these paybacks coming, I just hope we all have enough left to buy a sandwhich. The way Jay Chambers sees it, the semiautomatic weapons in his firearm collection might be the most promising investment in his financial portfolio. Like many gun enthusiasts, Mr. Chambers, a manager for a door wholesaler here, believes President Barack Obama and the Democrats in Congress soon will reimpose a version of an expired federal ban on the sale of so-called assault weapons. If such a law passes, he figures his collection -- enough guns, ammo magazines and weapon parts to assemble about 30 AK-47s, AR-15s and other semiautomatic rifles -- could triple in value. "A guy could easily make a lot of money," says Mr. Chambers, 47 years old, while at Autrey's Armory, a gun store about 20 miles south of Atlanta. Bubba Sanders, owner of Bullseye Supply LLC, in Brandon, Miss., said he has "a number of doctor clients whose financial advisers have told them to invest in ammunition. Beats the hell out of money markets and CDs. You can double your investment in ammunition in a year." Another perverse and potentially, very dangerous, consequence of the government not supporting output and employment! "An index of builders' confidence released Wednesday posted its biggest one-month jump in five years in April as many homebuyers seized on lower prices and incentives and took advantage of lower interest rates and tax credits." Back on March 27 I said to buy homebuilder stocks. The level of housing starts is unbelievably low. In 1972 the United States had a 200 million population and managed to construct 2.5 million homes. Now we have a 300 million population (and growing) and we are only building 500k homes?? This is a ridiculously low number. I own Centex (CTX), Toll Bros (TOL), Meritage (MTH) and Beazer (BZH). "As job losses accumulate here, along with the government’s debt burden as it tries to fight the ravages of recession, Mr. Horscroft’s nostalgia has been joined by harder-edged warnings — from no less a critic than former Prime Minister Margaret Thatcher — that Britain’s deteriorating public finances might require the government to seek aid from the International Monetary Fund, just as it did back in 1976 when the country’s economy was on its knees." Britain is in the opposite position of a country such as Spain (or other, Eurozone states). It is a sovereign, currency issuing nation where the government spends by crediting bank accounts (as in the United States). It can stimulate its economy to any degree that it wants. However, this fact seems to be lost on policymakers who, amazingly, are actually raising the prospect that Britain might have to go to the IMF for help. This is truly astonishing! Similar beliefs about debt, deficits and government spending are also rife in the United States and they could lead to the same sort of irrational policy desperation that we now see gripping Britain. This morning, Senator Judd Gregg of New Hampshire said on CNBC that the Obama Administration was "piling on an unsustainable amount of debt." Can he prove that? At what point will the debt cause lighting bolts to come out of the sky and keep the government from punching in another number on its accounting spreadsheet? I'd like to bet $1 million for anyone to PROVE, UNEQUIVOCALLY, that "unsustainable debt" was a real risk for the federal gov't, rather than just a catchy soundbite. Spain's central bank issued a stark warning to the country's government Wednesday, saying there is no more room to revive the economy with fresh spending. In an interview, the Bank of Spain's chief economist, Jose Luis Malo de Molina, also cautioned that any additional fiscal stimulus would have scant effect on the economy and require big spending cuts down the road to right the country's finances. The margin for new spending or tax cuts is "nonexistent" unless new measures to cut the budget deficit in the medium term are taken, Mr. Malo de Molina said. Failing that, "we will find ourselves in a situation where we have to apply restrictive measures when the economy is still in a phase of contraction," further deepening the slump. He neglects to explain or even mention that Spain is no longer a sovereign, currency issuing nation, so it does not have the ability to deficit spend without limit. Spain and other Eurozone member states are all functionally like a states within the United States. If they're strapped for cash, they're strapped for cash. They can't credit bank accounts like the Federal Gov't can. Paying back TARP is a cost to taxpayers! Many detractors of bailouts usually invoke the “Theory of Loanable Funds” when arguing against such measures. This theory suggests that when the government deficit spends (for anything), it takes funds away from the private sector, which could have been used for other, more productive uses. Therefore, deficit spending—whether for national defense, transfer payments or bailouts—only constitutes a “redistribution” of wealth and nothing more. What they miss is the fact that when the Treasury spends (for anything) it results in an increase in reserves in the banking system and those are the funds used to buy the securities that “fund” deficit spending. In other words, the money is provided by the government itself and therefore, does not take anything away from the private sector. On the contrary, it adds to private sector wealth in the form of a greater holding of one asset—Treasuries. On the other hand, when private firms pay back TARP money (which was just created simply by a keystroke on the government’s spreadsheet), the result is a net reserve drain: The funds go from the private sector to the Treasury and literally, disappear. 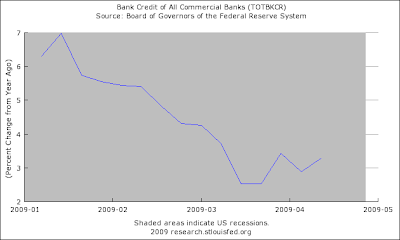 The banking system is left with fewer reserves and, all else being equal, the public loses. I say all else being equal because, in reality, the Fed will replace those funds if the reserve drain results in an unwanted increase in its overnight lending rate. However, given the current level of reserve balances the Fed may decide to leave system reserves lower by the amount of TARP money that has been paid back, so the public loses. I know Mike Mayo personally. His son went to the same pre-school as my daughter and he's a good guy with nowhere near the colossal ego as Meredith Whitney. However, he seems to share her problem of being buried in the bottom-up approach to stock analysis. Such intense number crunching often leads to missing the big picture, especially when basic conditions change. Mayo issued a, "Short all banks" recommmendation on April 6. Since then the Philly Bank Index (BKX) is up 25%. Last month in an interview on CNBC, Meredith Whitney was asked whether or not government stimulus would have any effect on the economy. She pretty much dismissed it and continued to focus on bank assets, remaining extremely bearish. In fact, she issued a "Short Citigroup" recommendation when the stock was trading at 2. It has more than doubled. Bottom line is, bottom-up stock analysis is fine, but you have to know when conditions are changing and a BIG element to any economic forecast is what's shaping up in terms of fiscal policy. Bernanke Bet on Keynes Has Meltzer Seeing 1970s-Style Inflation. NOT!! April 13 (Bloomberg) -- Federal Reserve Chairman Ben S. Bernanke is siding with John Maynard Keynes against Milton Friedman by flooding the financial system with money. If history is any guide, says Allan Meltzer, the effort will end in tears. Inflation “will get higher than it was in the 1970s,” says Meltzer, the Fed historian and professor of political economy at Carnegie Mellon University in Pittsburgh. At the end of that decade, consumer prices rose at a year-over- year rate of 13.3 percent. Another dumb Bloomberg article. This time they mix up Keynes and Friedman. Bernanke is absolutely following Friedman's doctrine of monetarism, not Keynes. Keynes advocated greater government spending to increase aggregate demand as a way of fighting falling output and employment. Friedman on the other hand, said that all problems can be solved by regulating the money supply. The Fed has been expanding the monetary base, which in and of itself has absolutely no direct or reliably predictable impact on aggregate demand. If we end up with inflation it is because Bernanke followed Friedman, not Keynes. Rather than truthfully telling lawmakers that the Fed did not have the power to restore demand, Bernanke chose to pursue a classic monetarist approach based on Milton Friedman. But of course Meredith Whitney will say it's "just and illusion!" Listen to Meredith Whitney's theme song! In Binghamton, N.Y., a Vietnamese immigrant upset about losing his job burst into an immigration center and killed 13 people before killing himself. In Pittsburgh, police said a gun enthusiast recently discharged from the Marine Corps opened fire and killed three police officers. And in Graham, Wash., investigators said a man whose wife was leaving him shot and killed five of his children in their mobile home before taking his own life. The carnage that occurred during less than 48 hours last week capped a recent string of unusually brazen mass killings, which crime experts say have touched more people and occurred in more public settings than in any time in recent memory. Comparative statistics are difficult to come by, but during the past month alone, at least eight mass homicides in this country have claimed the lives of 57 people. Just yesterday, four people were discovered shot to death in a modest wood-frame home in a remote Alabama town. The factor underlying the violence, some experts think, is the dismal state of the nation's economy. Criminologists theorize that the epidemic of layoffs, the meltdown of storied American corporations and the uncertainty of recovery have stoked fear, anxiety and desperation across society and unnerved its most vulnerable and dangerous. And if the eocnomy doesn't get better soon, crime and social disorder will explode. Once again, the consequences of the government not supporting output and employment because of a warped belief system that says if we do this, it's Socialism. By corollary, it means that everyone who thinks that way is okay with rising violence, social unrest and perhaps, ultimately, war. Dominique Strauss-Kahn, the managing director, said in February that the world was "already in Depression" and risked a slide into social disorder and military conflict unless political leaders resorted to massive stimulus. Very sobering, to be sure. Don't expect anymore massive stimulus here in the U.S. unless things get a lot worse. Our flawed belief system precludes it. This shows you that deficit spending is a natural response to falling output and employment. It also shows how the Federal Government has been a total failure at sustaining both. It's an outrageous shame that communities are forced to do this now. Why are we paying tax dollars to the Federal Gov't, when it has completely abrogated its responsibility as defined in the Constitution: "...to promote the general welfare..." This is sad, very sad indeed. Unless things get better soon you will see the level of frustration and outrage grow and the reaction all across the country will become more militant and desperate. Social disorder will erupt. Remember cognitive dissonance? I've spoken about it before. That's when an idea or view runs counter to your belief system. It causes stress or internal conflict. The way many people deal with cognitive dissonance is by rationalization, that is, they make up more and more reasons why their view must be correct and the opposing view wrong. Recently a number of banks reported very strong profits so far for the year. This development is highly contrary to Whitney's view, so she has to rationalize it. And what is her rationalization (explanation)? She says the profits are an "illusion." This type of rationalization is similar to the laughable stuff that comes from people like Jim Rogers or Peter Schiff. When the economic data is good or when the facts run counter to their views they simply say, "Do you BELIEVE those numbers??" It's their way of saying that the government is making up the numbers and telling us all lies: That THEY are right and you must believe them above whatever mountain of evidence is presented, because ALL the evidence is made up. Same with Whitney. When she says that the profits are "an illusion," she's gone completely hyperbolic. FDIC Chairwoman, Sheila Bair, set up an invitation only meeting in New York for hedge fund managers so that she could "pitch" the government's plan to rescue the banking system--a system that is a construct of the government itself. It is very likely that if this plan goes through, some hedge fund will be the proud owner of your mortgage. And the government will essentially "pay" these speculators to buy the assets from banks. The whole thing is so perverse that it is almost comical. Banks are agents of the government, created, ostensibly, to act as a credit conduit between the government and the private sector. They get their funds from government guaranteed deposits; they have lifelines to the Fed and the assets they own are regulated by the government so that they can only be the safest assets. With absolutely no effort whatsoever the government can sustain the banking system so that it functions in its mandated public purpose, which is to make loans to the private sector. But once again, a belief system, keeps them from doing that. The very idea that gov't might have to guarantee all deposits and/or provide sufficient and ongoing, non-collateralized liquidity via the Fed, is viewed as unacceptable because in the minds of out-of-paradigm thinkers, that translates to, "having to provide more taxpayer dollars." So instead, we will guarantee windfall profits (with taxpayer dollars) to a small group of wealthy speculators by ceding the nation's bank assets (which, at least obliquely, are the property of the public), while the average working person gets $10 per week more in his or her paycheck! While today's job numbers showed a year-over-year percentage decline in payrolls that has been the steepest so far since this recession began, there is reason to be optimistic. Other readings of the economy are showing that there is some improvement underway. Retail sales, manufacturer's orders and a broad index of stocks all have been rising in the past few months, suggesting that the worst is likely over when it comes to job losses. Of course, this does not mean a rapid turnaround in hiring, however, if we just start to see these job losses moderate, that could be good news for stocks and for sentimnet. The Japanese government is lending money to Toyota, which is losing money (no one in Japan is asking, is it "viable? "), so that the automaker can continue selling cars in the United States. Smart move: Toyota will grab market share from GM and Chyrsler as the U.S. Government forces them into bankruptcy. All from an Administration that is purportedly for the working class and saving American jobs. Unreal!! Our belief system is killing us. It's too bad that we need a 97-year old economist to tell us what we need to do. Shows you what they teach (and don't teach) when it comes to economics these days! My main point was that the culture of speculation, while perhaps not invented in the United States, was taken to heights never before seen in history and we "exported" that around the world. While other countries were educating their kids to become engineers, scientists, doctors and mathematicians, we were cranking out MBA's to go work at Wall Street investment banks to flip arcane financial instruments that did nothing to add value to the real economy. Those privlieged few earned enormous compensation while most of the rest of the working population saw their incomes stagnate. The U.S. has a lot to be proud of and the world owes us a debt of gratitude for many things, but the era of unbridled speculation that was pushed so zealously by our policymakers for so long (Rubin, Greenspan et al) has to stop. The brain power that went into creating the products and markets that formed this "casino economy" must now be refocused into delivering the more productive inventions and innovations that will form the foundation of stable, long-term growth and prosperity. Protesters in the streets of London at today's G20 meeting and the silent, irate majority elsewhere have every reason to be "hurt, frightened and very angry," says Martin Wolf, chief economics commentator for The Financial Times. As a result, "people in the developed world suddenly feel completely out of control for first time in 70-80 years," he continues. "Huge forces are now unleashed." These forces include the kind of social unrest evident in London and more recently in emerging economies; similar disturbances are very possible in America too, he says. This is what happens when governments are not allowed to sustain economies because of belief systems and because of ideology. The "free market fundamentalists" should be the first to go if angry mobs are rational enough to know who to blame, but they won't be, meaning that anyone is at risk of being swept up in social chaos disorder when it begins to spiral out of control. “Demand has never been greater and money never been lower,” remarked Iris Godes, assistant vice president of enrollment management at Quinsigamond Community College, in a U.S. News article published in January. Investment in education is critical to the long-term competitiveness and prosperity of our nation. However, the economic downturn is causing colleges to accept higher percentages of students who can pay for their tuition. And the belief that government is limited in its means--that it doesn't have enough money--is will lead to a bleak society of the "haves and have nots," where the few who are wealthy and privileged will enjoy education, health care, prosperity and a generally high standard of living, while the rest of society struggles and slides backward. Last September’s bankruptcy of Lehman sent markets around the world into a nosedive and economic activity followed. Lehman’s complex interrelationships with financial counterparties triggered a domino-like collapse, the repercussions of which are still being felt today. While Lehman was a big firm it was nowhere near as big as General Motors. Moreover, as a financial intermediary that basically brokered or traded paper contracts for itself or other parties, its contribution to the real economy was small. General Motors on the other hand is a different story. As an enormous producer of cars, trucks and other vehicles, and the owner or developer of the technology involved in that process, it is an important part of our nation’s stock of real wealth. Putting GM into bankruptcy (and Chrysler as well), by definition leads to the diminution of the real wealth of society, both now and in the future. Many people argue that GM and the other U.S. automakers are “not viable” and should be left to fail. Even President Obama has been saying this. However, the viability argument is tenuous at best. General Motors, until recently, sold more vehicles than any other automaker in the world and with all its problems is still only marginally behind its closet rival, Toyota. For those who espouse market fundamentalism—that the market should dictate the success or failure of firms—then GM has been quite viable. Those who argue that GM’s legacy costs—its contracts and commitments to employees, many of whom are union members—reduce its long-term competitiveness; fail to understand that for decades the Japanese government engaged in policy designed to support their automakers and to bestow upon them competitive advantage. That included protectionism, direct subsidies, currency manipulation and other impediments to free trade. Now that those policies have diminished we see Toyota and other Japanese automakers struggling with many of the same problems that GM has. For the first time ever they are experiencing operating losses and are having to shed jobs and close plants. Yet you don’t hear anyone asking whether or not Toyota is viable. The real problem faced by GM and automakers everywhere is that we are in a global economic contraction that is the worst the world has seen since the 1930s. Even the best run firms, both inside and outside of the auto industry, are having a hard time coping with that. It is a shame that President Obama has chosen bankruptcy as the path to fixing GM’s problems. For one thing, bankruptcy is not likely to be as quick as he envisions. On the contrary, for a firm GM’s size, it’s likely to be a long, drawn out affair with many, many, other firms and with millions of workers affected. At a time when the economy is struggling just to stabilize, this creates a high probability that it will be sent crashing down to an even weaker state. Putting GM into bankruptcy is not the answer. Adam Smith once said, “the real wealth of a nation is the abundance of its consumables.” Reducing our capacity to produce the vehicles that will eventually be needed by the current and future generations—and the technology that goes along with that—leaves us poorer as a nation. That is the real legacy we will be handing down to our kids.